By the time potential clients reach out to me in order to initiate therapy, they have already attempted many different approaches to deal with the problems which beset them. When issues continue despite continued efforts to change, therapeutic approaches which make use of a variety of interventions become necessary. 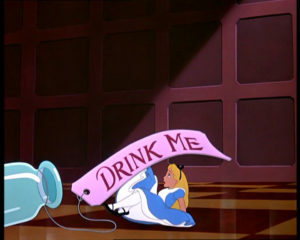 When Alice found herself at the bottom of the rabbit hole, she was presented with a very small door. This was her only option to progress forward, however, she recognized she was way too tall to fit through the door. A solution appeared before her in the form of a liquid inside of a small bottle with an instructional label which read "drink me." As she drank the liquid, it shrank her to the appropriate size to exit the room. She did not understand how it worked, why it worked, or how to replicate the change, however, the solution allowed her to move from feeling stuck, to gaining the freedom to move forward. All too often, the general public assumes that therapists take a logical approach to helping individuals, couples, and families implement changes in their lives. However, it is typically these logical or obvious attempts which perpetuate the very problems which people are trying to change. I find that this regularly contributes to why people have not successfully implemented changes prior to contacting a therapist. In order for therapists to effectively evoke a different way of thinking, feeling, believing, or responding to established and maintained problems, therapists make use of theoretical ideas and interventions which are designed to create changes in ways which does not typically make sense on the surface. The kinds of theoretical ideas which inform therapist actions with clients come from many generations of therapists who have experienced what we call "client resistance" to efforts which are designed to solicit change. Its not that clients are rebellious, however, the factors which maintain the problem are often much more complex than what the client and even therapist sees at the start of therapy. The real value of therapy is accessing the possibility for something different to occur. Whether its the presence of a 3rd person, or a new perspective, or risking a new behavior, or adjusting a belief, the possibility of change can become a reality when we experience interventions which extend beyond our own capacity to change. While therapy does provide expert advice or direction at times, the primary mechanism for long term change must come from within the client, and client system. We call this Second Order change. There must be a hopefulness coupled with new experiences which allow for a transformation to occur. Even if we do not understand the therapeutic process or intent of clinical interventions, change can happen, both immediately, and over time. While it may be desirable for clients to understand the process of change which occurs in therapy, I have found that this is not necessary. I believe that change which relates to the alleviation or resolution of presenting problems is effective if the client fully understands it, or if they really cannot explain it. Comprehending how change happens is more essential for the therapist to understand than it is for the client. I hope that if you, or someone you know is feeling stuck and hopeless regarding lifes problems, that seeking out therapeutic assistance will provide a hopefulness that new solutions are available.